The freedom afforded by a reliable and good-sounding wireless system shouldn't be underestimated. Line 6 has truly picked up the baton. Great sound. Reliable performance. Innovative cable tone feature. Not cheap. Cable is too short for some guitars. Guitar wireless systems are commonplace these days - after all Fender, almost unbelievably, introduced an embryonic cable-free set-up as far back as 1961. Although the unit, the TR-105, was ultimately discontinued just a year later, one of the reasons for its development and introduction was to protect musicians from the rather ropey electrics prevailing in venues of the time. 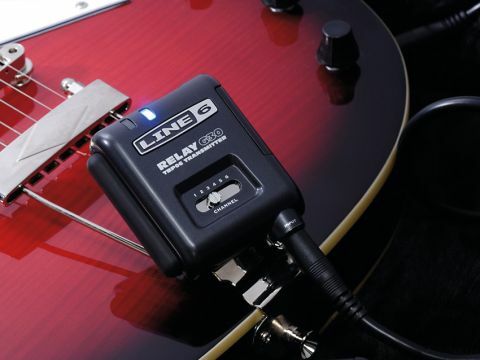 Today, it seems that Line 6 has brought similar levels of invention to that established idea, and there are a couple of features on the Relay G30 that set it apart from the vast majority of affordable systems available today. Its USP lies with the unit's transmission frequency. Most contemporary systems - including the G30 - operate within the UHF band, sited between 300MHz and 3GHz. Where this system differs is that it operates almost at the very top of that congested range, at 2.4GHz. That means a vastly reduced chance of any interference from radios, mobile phones and the like. "Never once were our licks and riffs sullied by a taxi driver or mobile phone shrieking over the airwaves." The system comprises the familiar marriage of a TBP06 transmitter and RXS06 receiver, each of which possesses a sliding selector for access to a total of six channels. The transmitter is powered by a pair of AA batteries, which Line 6 says will give up to eight hours of continuous use, and is bereft of an external aerial. The receiver is slightly larger in size and powered by the included DC-1 PSU. Moreover it includes a three-way selector for its Cable Tone feature, intended to allow users to darken the tone if required. It's an interesting concept, as Line 6's Dan Boomer explains. "All guitar cables have [signal] losses and many players have crafted their sound with these losses in place." he says. "The G30 has virtually no losses so we added Cable Tone so that you can recreate them if they've become part of your set-up. Basically, it's a software model of the alteration a typical cable does to pure sound." Using the rather modest 67mm cable supplied with the G30 we hooked up our ESP GL-56 to a Peavey 3120 and got to work. The first thing you notice is the sheer freedom you have when released from your umbilicus. It's truly liberating and we got well over 50 feet away from the amp without noticing a loss of signal or tone. Equally critical, never once were our licks and riffs sullied by a taxi driver or mobile phone shrieking over the airwaves. There's no doubt that the tone is louder and toppier when compared with that of a traditional cable, thanks to the improved efficiency of the signal transmission itself - we found that we set the cable tone to its darkest setting for the majority of the time. It's a subtle effect at best, but does discernibly round off the majority of trebly edges. Of course, for cleaner, janglier styles you could even consider turning the switch off. The only niggle here is that the lead provided is a little too short for certain guitars - a Flying V, for example - and we suggest buying (or indeed knitting) some sort of holster to allow you to attach the transmitter more securely to your strap. After it dropped from ours for the third time we simply popped it in our pocket. Could this be your last wireless system? Possibly, and we'd strongly recommend everyone experience the freedom of going cable-free at least once. At £285, the G30 isn't the cheapest system available today, but it ticks all the right boxes and is, on balance, certainly among the best we've come across so far. Simple to use and, far more importantly, hardly the tone-killer that wirelesses are presumed to be by the uninitiated. Why not give it a go?